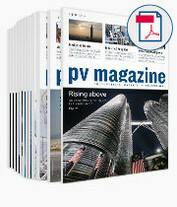 The annual pv magazine global digital subscription comprises 12 issues at a rate of € 89, including VAT where appropriate. We will email you the download link after successful receipt of payment. The download link is valid for 30 days. Your invoice will be mailed separately. If you decide on an automatic extension of your subscription, you will automatically receive pv magazine global the following year. If you opted for automatic extension with your purchase and no longer wish to subscribe to pv magazine global after 12 months, please email or post us written notice of cancellation at least two months prior to the expiration of your current annual subscription. If written notice is not received by this time, your subscription will be automatically extended for a further year. It may then only be cancelled following the receipt of two months’ notice prior to the conclusion of the next 12 month subscription period. The special price for an annual student digital subscription to pv magazine Germany amounts to € 59, including VAT where appropriate. If you would like a student subscription, please contact our reader service directly and send an e-mail to support@nullpv-magazine.com. A student ID or certificate of matriculation is required and must be made available to our reader service.